Tyson Foods and Momversation are sponsoring a Chicken Sandwich Recipe Challenge for charity. Using Tyson Chicken Breast Filets, six bloggers were challenged to come up with the ultimate sandwich. Readers get to vote for their favorite, and Tyson will donate $5000 to the winning blogger’s charity of choice. I came up with a Greek Chicken Pita Sandwich using red wine vinaigrette, tzatziki, arugula, and whole wheat pita. The charity I’m playing for is the Capital Area Foodbank in Washington, D.C. CAFB works with 700 partner agencies in the D.C. metropolitan area to distribute 23 million pounds of food a year. Many families and children in the D.C. area go hungry everyday, and CAFB and its partner agencies work very hard to help those people. For every dollar donated to CAFB, they are able to provide three meals to people in need. So winning this $5000 charity promotion equals 15,000 meals that they can provide. Voting is open through March 1, 2011, and you can vote once a day. So vote early and vote often! Visit Momversation to cast your vote in the Tyson Chicken Sandwich Challenge, and thank you for supporting CAFB! This sandwich is inspired by some of our favorite Greek foods. The chicken is topped with a simple Greek red wine vinaigrette, tzatziki, and small arugula leaves. Well-stocked grocery stores and delis may carry tzatziki, a Greek condiment made with yogurt and cucumber, otherwise you can easily make your own using the recipe below. The remaining vinaigrette can be used on salads and tzatziki makes a great, healthy dipping sauce with pita chips and raw vegetables. Small arugula leaves have a milder taste than the large peppery leaves, so look for the small leaves at your local market. 1. VINAIGRETTE: In the cruet, add the red wine vinegar, garlic, basil, oregano, lemon juice, olive oil, sea salt, and pepper. Cover tightly with the lid and shake until well mixed. Will keep in the refrigerator for up to 1 week. 2. TZATZIKI: Strain the yogurt in the cheesecloth over a medium bowl for several hours until most of the liquid has drained off. Press the grated cucumber in a strainer until it feels almost dry to the touch. Stir the yogurt, cucumber, and lemon juice together in a medium bowl and add the mint, garlic, sea salt, and black pepper. Stir well and chill for 2 hours. Will keep in the refrigerator for up to 1 week. 3. 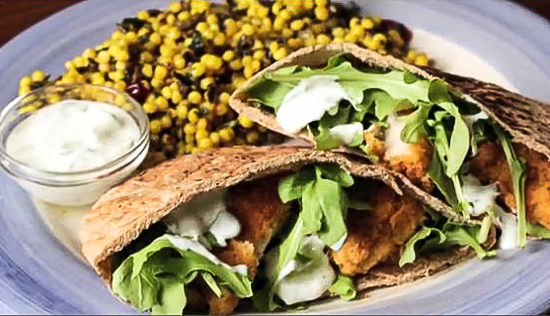 ASSEMBLE: For each sandwich, arrange the chicken strips from 1 chicken breast filet inside one pita half, then drizzle 1 tablespoon of the vinaigrette on top of the chicken. Add 2 tablespoons of tzatziki and stuff in the small arugula leaves.